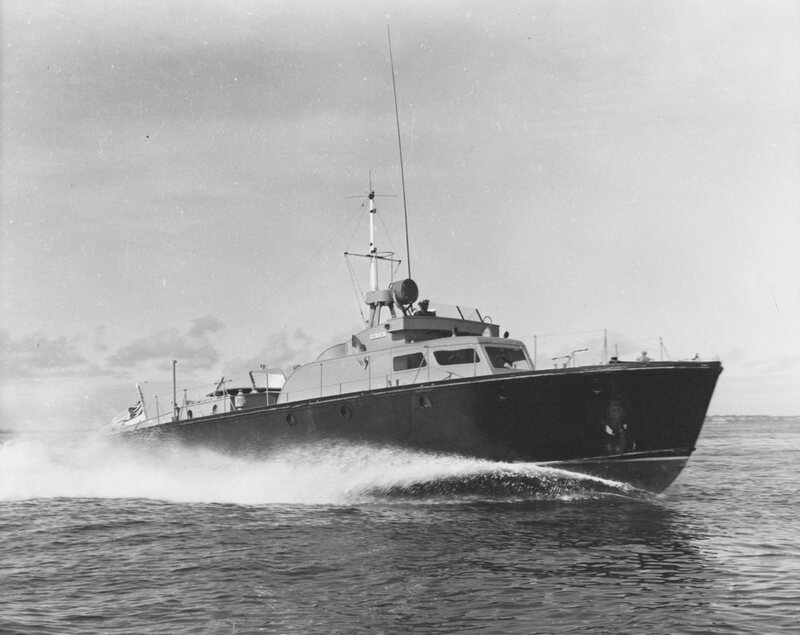 HMAS Air Guide was one of 21 air/sea rescue (ASR) vessels originally built in the USA and Canada between 1943 and 1945, and transferred to the RAN under the Lend-Lease Agreement. These vessels were originally designed as anti-submarine craft but their high speed and manoeuvrability made them ideal as search and rescue vessels. In this role, their hulls were painted black and their upper decks and superstructure painted bright yellow. One vessel, HMAS Air Sprite, was built locally in 1960 to an almost identical design. Air Guide was commissioned as HMAS Air Host on 20 October 1944 in Sydney under the command of Skipper (later Sub Lieutenant, RANVR) Alexander McLean and officially listed as a tender to HMAS Rushcutter, and later to HMA Ships Melville and Madang. Her name was changed from Air Host to Air Guide sometime between January and April 1945. 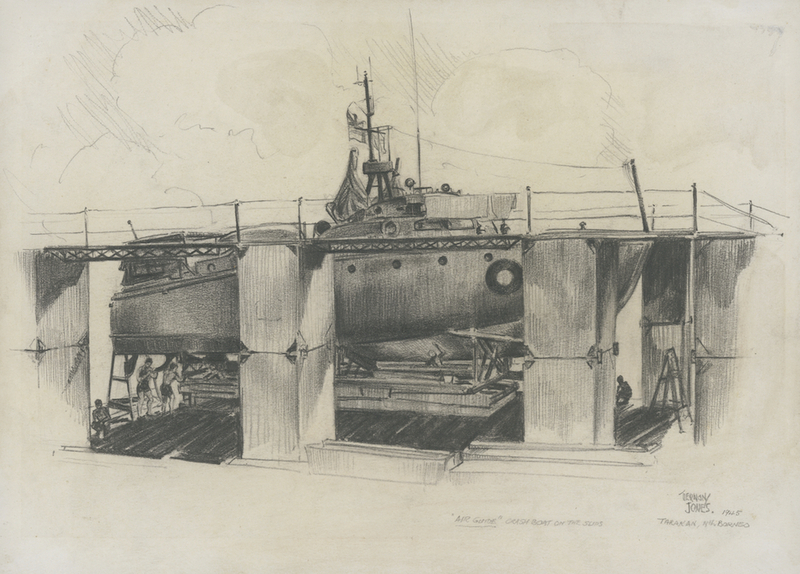 She remained alongside in Rushcutter’s Bay immediately after commissioning awaiting the installation of additional radio equipment and preparing for sea. Following trials and inspection of underwater fittings, she finally put to sea on 23 February 1945 and proceeded to Jervis Bay for exercises and to conduct ASR duties with Royal Navy aircraft carriers of the British Pacific Fleet. On 28 February she suffered considerable minor damage during inclement weather off Jervis Bay and three crew members required medical attention. Although the damage and was quickly repaired and the injured crew members made a swift recovery, the incident did demonstrate how susceptible the vessels were to damage in rough weather. She departed Sydney on 8 March, in company with her sister ship HMAS Air Foam, and proceeded northwards bound for Madang, New Guinea. She arrived at Madang, in company with HMA Ships Air Clan and Air Rest, on 17 April and later proceeded on to Tarakan, Borneo. A new airstrip was built at Tarakan in June and Air Guide was constantly required to provide ASR coverage for aviation operations. She was also, on occasion, required to transport small numbers of Japanese prisoners of war from nearby locations to the base at Tarakan as well as providing occasional medical transport. Following the Japanese surrender on 15 August, Air Guide remained in Borneo on ASR duties and conducting Allied intelligence officers in the region seeking information about missing Allied airmen as well as monitoring Japanese troop movements following the surrender. Just before 01:30 on 20 September, Air Guide, assisted by a Catalina aircraft, rescued 24 people whose Douglas DC-3 aircraft had crashed into the sea some 100nm from Tarakan. The search for the aircraft had begun at around 10:30 the previous day. She moved to Morotai, Indonesia, under tow from HMAS Gawler, in December and on New Year’s Eve rescued a soldier adrift in a canoe. She remained in Indonesian waters until April 1946 continuing ASR duties and conducting Royal Australian Air Force crash investigation and war graves personnel around the area. She also conducted an unsuccessful search for five Japanese prisoner of war escapees in January 1946. HMAS Air Guide at speed. She returned to New Guinea waters at the end of March and on 3 April 1946 began passage back to Australia departing Langemak under tow from HMAS Wilcannia in tandem with HMAS Air Faith. Part of the passage between Langemak and Port Moresby was conducted under her own power as foul weather made continuing the tow untenable. She arrived in Sydney in May and decommissioned on 9 August 1946. She was transferred to the RAAF in 1949. She was returned to the RAN in 1965 though did not recommission, and was sunk as target in the early 1970s. Air Guide following her transfer to the RAAF.